3 June 2015. Digital Manufacturing and Design Innovation Institute in Chicago is developing a technology platform to make it easier for manufacturing companies to share technical data with their customers and suppliers, adapting concepts proposed by General Electric, which was chosen to lead the project. The platform, known as digital manufacturing commons, is expected to be an open-source asset for manufacturing supply chains. 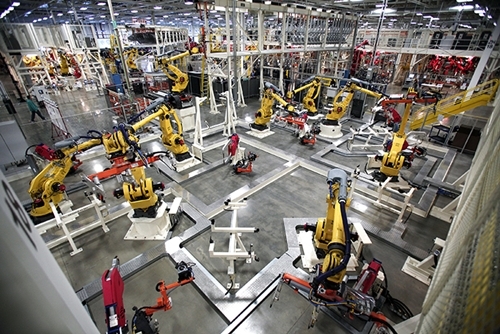 Digital Manufacturing and Design Innovation Institute is a consortium of some 70 manufacturing companies, universities, not-for-profit research labs, and government agencies that encourages development of smarter and more efficient manufacturing, particularly with tools that link together different parts of the often fragmented manufacturing ecosystem. The institute aims to bridge the gap needed to connect basic research on manufacturing conducted in academic labs and funded mainly by government with commercialization of research discoveries by industry. GE says its global research division was chosen by the institute to lead the digital manufacturing commons initiative because of its work in developing a digital ecosystem for its own factories and suppliers. The company is advancing the concept of the brilliant factory that digitizes the extended manufacturing process from design through fulfillment, and can adjust in real time to changing conditions, or even problems that haven’t yet happened. An essential ingredient of the brilliant factory is the digital thread connecting data about the manufactured product created throughout its lifecycle and across its supply chain. While data are being created at all stages of a manufactured product’s lifetime, the data are not aggregated or connected, thus not providing their full benefit to other stakeholders in the product’s development, manufacture, and distribution. The digital manufacturing commons aims to create an open-source platform for aggregating manufacturing data into a digital thread. GE says it plans to build on the crowdsourcing cloud-based software designed three years ago with DARPA and MIT for the development of military vehicles and complex design systems. That software, says the company, makes it possible for scientists, engineers, and designers to form teams and share ideas, as well as submit designs to communities of experts for testing and vetting. Neither GE nor the institute give a target date for completion of the digital manufacturing commons, but a company statement says its goal is to attract 100,000 users from companies, universities, research institutes, and entrepreneurs by 2017.